The Baire metric induces an ultrametric on a dataset and is of linear computational complexity, contrasted with the standard quadratic time agglomerative hierarchical clustering algorithm. In this work we evaluate empirically this new approach to hierarchical clustering. We compare hierarchical clustering based on the Baire metric with (i) agglomerative hierarchical clustering, in terms of algorithm properties; (ii) generalized ultrametrics, in terms of definition; and (iii) fast clustering through k-means partitioning, in terms of quality of results. For the latter, we carry out an in depth astronomical study. We apply the Baire distance to spectrometric and photometric redshifts from the Sloan Digital Sky Survey using, in this work, about half a million astronomical objects. We want to know how well the (more costly to determine) spectrometric redshifts can predict the (more easily obtained) photometric redshifts, i.e. we seek to regress the spectrometric on the photometric redshifts, and we use clusterwise regression for this. 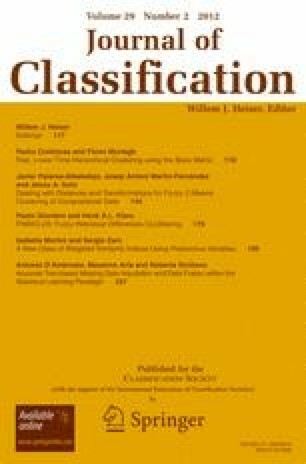 D’ABRUSCO, R., STAIANO, A., LONGO, G., PAOLILLO, M., and DE FILIPPIS, E. (2006), “Steps Toward a Classifier for the Virtual Observatory. I. Classifying the SDSS Photometric Archive”, 1st Workshop of Astronomy and Astrophysics for Students-Naples, April 2006, http://arxiv.org/abs/0706.4424. LONGO, G. (2010), “DAME. Data Mining & Exploration”, http://people.na.infn.it/astroneural/. SDSS (2008), Sloan Digital Sky Survey, http://www.sdss.org.